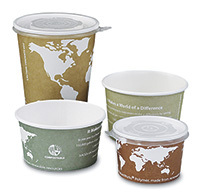 Cups are perfect for hot soup or other liquids and are 100% compostable. Will break down in 60 days in a commercial composting facility. FDA approved cups are lined with a vegetable-based coating to prevent liquids from absorbing through the cup. Printed with World Art. Cups meet ASTM D6868 specifications. Certified by the Biodegradable Products Institute. Not recommended for use in microwaves. Soup lids are sold separately and are not compostable.